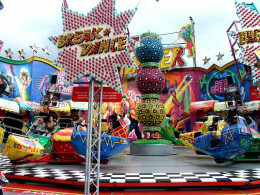 What do you remember from the carnivals you went to as a kid? The town near where I lived had a fair every year. We would go and see the animals that were being shown. For rides, my favorite was called The Round Up (I think). You stood against the wall and it spun around making you stick to the side. Very death defying when you are young! I remember going on the Ferris wheel with my older cousin and her rocking it back and forth. I was afraid I would slip under the bar and die. I think that is where my fear of heights came from. I remember silly things, like playing the coin toss and winning ash trays and unattractive glassware. Also a chicken who was kept in a perspex box and when you put your coin in, it would peck out a tune on a plastic piano. Rather cruel when you think of it now. Eating lots of cotton candy, candied apples and other things that were packed with sugar. I have lots of memories about carnivals. Once, I remember being on a ride called something like a Sky Rocket that was similar to a ferris wheel of cages and it was a really fun ride for an 11 year old. A storm came up suddenly and my sister and I and two of our best friends were on the Sky Rocket when the wind whipped up and it started raining cats and dogs. The brakes weren't catching well and all the other rides were closed but we kept going around. We were the last ones to be able to get off the ride (by jumping into a scared carny's arms) and we were soaked to the bone. We thought it was wild and fun. We were too naïve to realize the danger we'd been in. But the carny man felt so bad about not being able to stop the ride safely that he gave us free rides for the whole time the carnival was in our town. We were in heaven and thought it was the best carnival ever! I remember seeing the huge sideshow canvases with paintings of all the freaks to be seen within. I never went inside. You couldn't have paid me to go inside. One moment has always stuck with me over the years. I was walking by the canvases, doing my best to ignore the grotesque paintings, but there was a small audio speaker hanging above that was spewing forth a phonograph recording of a man telling all about the freaks, but the record was so worn out that you could only make out a few words here and there. Most of it was just muffled nothingness with slight ups and downs in pitch as the man droned on and on about the wonders to be found behind the canvases. The sound of this recording has haunted me for over forty years. I remember all the souvenirs "on a stick" that you could buy. Like the stiffened doggie harness on a stick that you walked so that it looked like you had an invisible dog on a leash. Or the plastic bird sttached to a stick by a string. The bird was supposed to chirp when you swung it around, which looked really cool when the man selling them did it, but the one I bought did not make any noise. After taking it back to the man, he swung it around and around and declared that it worked just fine, even though the plastic bird was entirely silent the whole time. So basically I ended up with a dumb plastic bird on a stick that even the cat wouldn't chase. Probably the best thing on a stick that I bought was a real live lizard tied to a small stick. You stuck the stick in your pocket and the poor terrified lizard would hang onto the outside of your pocket. After a couple of hours of public display, my grandma untied the lizard and put him in a terrarium for me. He lived there for several years until he escaped into the house somewhere. We never found him. The city where I lived banned sales of live animals at carnivals and fairs by the time I got to middle school, probably a good thing, but I sure loved my lizard. We tended to go more to local community fairs, than carnivals (which tend to pop up in random places like mall parking lots around here) so my favorite was always the fireworks! Our big fair in this area is the Big E/Eastern States Expo, which is basically like a state fair for all of New England, and my favorite thing there was (and still is) without a doubt the Avenue of the States. Each New England state has its own building, and will have different food, crafts, vendors etc. that represent the state. My favorite is always an apple cider slushie from the Vermont building.